As luck would have it, my three February days on Ballogie this year included opening day. There was great anticipation as Monday 2nd February 2015 approached. Opening day is always special and carries a unique kind of frisson of excitement. 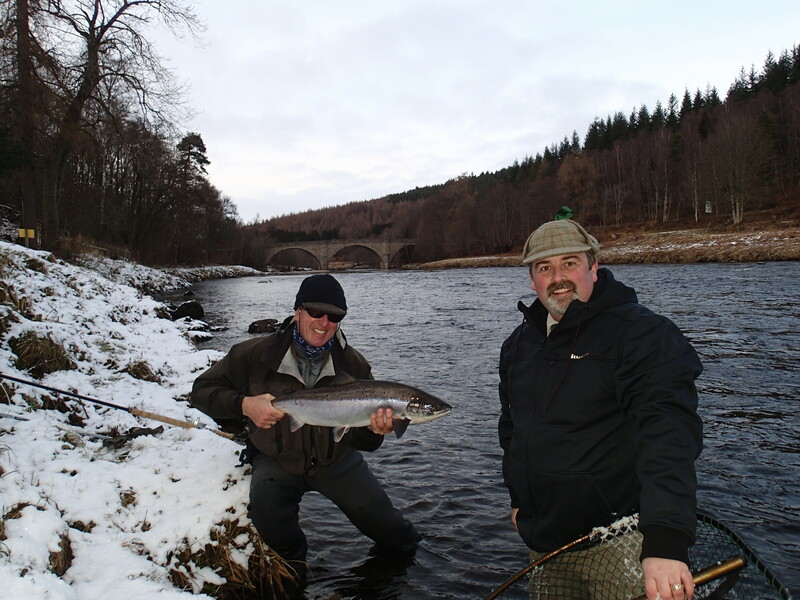 Hope springs eternal in the breast of the salmon fisher and here’s hoping that 2015 will see better runs of returning Atlantic salmon to the rivers of Europe.Opening day on Deeside dawned cold with the dreaded grue (floating ice) evident in the River. I couldn’t help but note that the water level on the Potarch Bridge guage at 1’ 4” with a temperature of 33F was over 2’ and 10degrees F. lower than the same time in 2014 when the Ballogie beats enjoyed such a bonanza of a start. 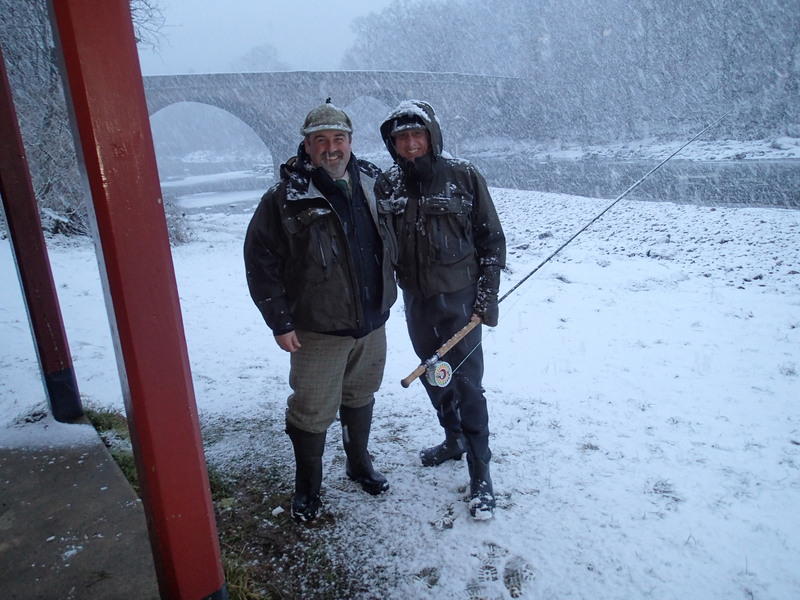 The morning was quiet for all of the rods apart from a couple of kelts and a rawner from the Sands for Jim Carson. 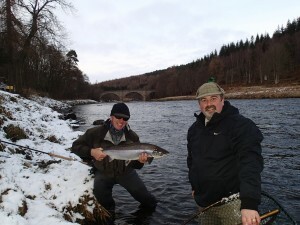 As we were enjoying our lunch by the warmth of the hut stove, Sean the ghillie arrived with the cheery news that a 15lb springer had just been landed above us from the Boat Pool, Carlogie by Tom Marshall and a 10 lb springer below us from the Garden Pool, Commonty by Graham Ritchie. Interestingly, both of these fish were landed after 1pm when we were having lunch. Moral of the story….don’t tarry too long in the hut on these short spring days! It is a fact that in early springtime the warmest part of the day often occurs around 1pm just as we are expected to break for lunch. Salmon seem to respond positively to this change in air temperature and provide us with a chance of hooking them. A word of warning though. If you have opposition on the far bank (most Dee beats are single bank fishing) then check with your ghillie before ignoring the usual lunch break between 1 to 2 pm. After lunch, it was my turn to fish the upper half of the lower beat from the Bridge Pool down to the Inchbares. In the Bridge Pool I had an interesting experience. About two thirds of the way down the pool I had a vicious tug to my 2.5inch(wing length) Black & Yellow brass tube fly. This can sometimes be a signal that your fly is too big so I immediately pulled in my fly and changed to a smaller B&Y bottle tube with an overall wing length of 1.5”. On my very first cast over the same water I had a strong draw which resulted in a well hooked fish. Ok it turned out to be a kelt but does it prove a point? Another kelt took soon after in the tail of the pool and that was that. Sean had alerted us in the morning that it was a good height for the next pool down, Burn of Angels and sure enough, the trusty AFS hover with type 3 tip and B&Y bottle tube felt as if it was fishing well. As you wade under the wires which cross this pool, your fly is covering some nicely paced water mid stream and it was there I had a great take and run which felt right away like a springer. Quick call to Sean brought him down with a net and after a good tussle it was a nice feeling of elation to see the fish slide over the net. 13lb in the weigh net! By the time I got down to Inchbares (one of my favourite casts in the lower beat) the light was all but gone and that was that.Eleven on Fishdee for the day but interesting that nothing was caught south of Invery. 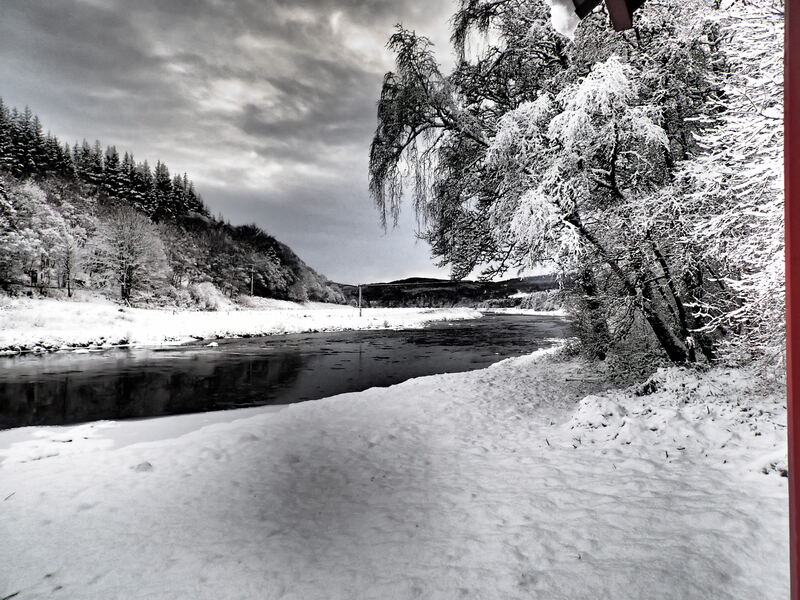 -11c at Braemar overnight meant Tuesday for us was a write-off due to the dreaded grue. Without sunshine during the day, the ice didn’t abate till the last hour when I ventured up to Sands for a cast. Kelt activity but no sooner had I started than a blizzard started and the light faded. and they call this spring fishing! so three of my rods deserted to make there way home. Enter Lawrence and Dave into the Ballogie hut. Good timing. I told them I would give them a call if and when the grue cleared. This happened just after 1 pm so they were duly alerted to help themselves to the top half while Sean and I concentrated our efforts from the Bridge down. It felt good. Windless and pleasant but all I could find were kelts, nine of them, from the various pools I visited. Sean also had kelts and a rawner from the Bridge Pool which had him excited. Meanwhile good news from the Slips. Lawrence had demonstrated his skills by pulling a feisty 12 pounder out onto the ice. Not an easy place (although my favourite cast on the top beat) so very well done Lawrence To conclude, conditions in the opening week were tricky to say the least. The grue effectively restricted us to two afternoons fishing in our three days and it is too early to guess what number of springers maybe in the Dee. 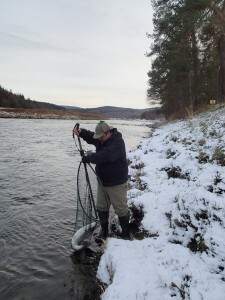 It is however concerning that few fish were caught downstream from Invery/Crathes Castle apart from three in the week at Lower Crathes and West Durris.